This is a good entry level table to replace the wooden tables that are so common. Casters are standard on this model. You can add optional drawer underneath for more storage space. Table construction is 16 gauge Type 304 stainless with heavy stainless hardware. Table is shipped assembled. Platform under cooker eliminates the need for concrete paver. 36" x 28" x 36" high This table will not take a Classic Please specify what size cooker you have. 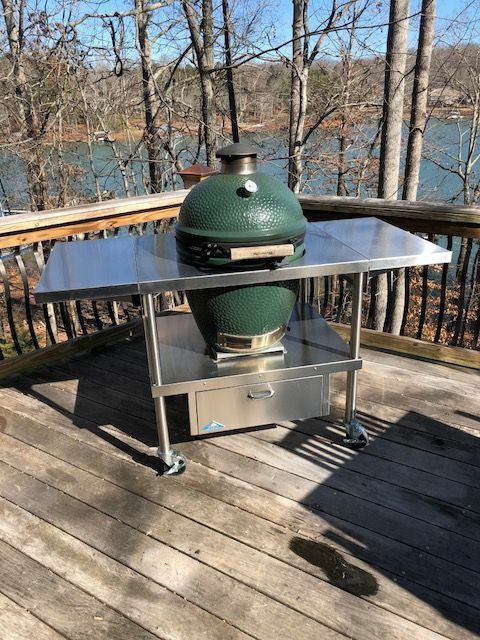 If you have newer Kamado Joe and want this style table, add $100 due to added depth of table.